Do you remember back in the days where laser light shows were the coolest thing you watch? Honestly I’m not nearly old enough to remember that sort of thing, though now and again I do hear of a laser Floyd show that I’d love to check out (huge classic rock fan here). I imagine that a good part of you could at least understand the appeal of colored lasers moving in sync with music, but what would you think about bubbles? I just can’t imagine thinking to myself “boy, I bet this song would rock if there were some bubbles moving with the beat.” Apparently there is at least one person on this planet that had that very thought, because the Sound Bubbler was born. 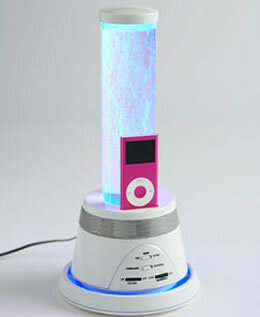 This strange little device has will let you hook up your iPod (or anything with an audio output jack) and spits out bubbles while changing colors to the beat of your music. I guess that maybe you’d be able to see some cool stuff on your walls with the lights off, but I just don’t see it being all that cool. No word on pricing or availability. Rev Keith C. Leathers Sr. This site stinks; sorry, but I’m just being honest! I’ve been looking for the Audio Bubble Light EA108 or the iPod Sound Bubbler; naturally I can’t find any. I have over 30 years as a Computer Science Analyst and more experience on locating items on the internet than most; and if I can’t find them (except in China by the gross) then what use is there in commenting on something no one can even buy. Elite in China only sells by the thousands; so thanks for nothing.